Skip the takeout! 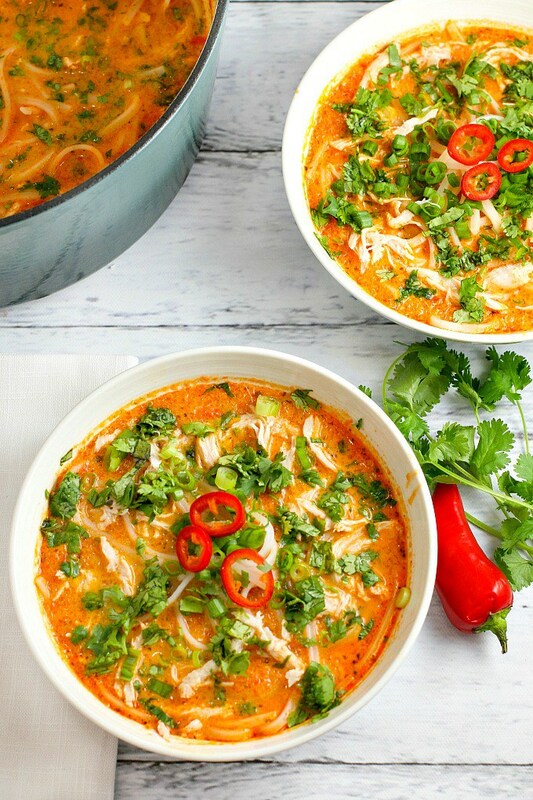 This Thai Chicken Noodle Soup is easy to make at home with ingredients you can find in your local supermarket. If you love Thai food, you need to try this recipe! Combine garlic, onion, red pepper, ginger paste, lemongrass paste, red curry paste, cilantro paste, red chili paste and coconut oil in a food processor, and process until a paste forms. While you are making your paste, start boiling water for the rice noodles. Add the paste to a medium pot and fry it for a couple of minutes, just until it’s fragrant. Add the chicken stock and coconut milk and bring to a boil, Reduce heat to a simmer and simmer for about 10 minutes. In the last couple of minutes, add your shredded chicken. While the soup is simmering, cook your noodles according to the package directions and drain. Add your fish sauce, lime juice and zest and rice noodles to the soup. Garnish with chopped cilantro, green onion and green and red chilies.